1. Determine the light spectrum of three net colors and how color differences influence the light quality and quantity of incoming radiation throughout the day. 2. 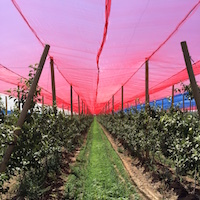 Quantify the impact of nets on orchard microclimate, photosynthesis, vegetative growth and tree stress. 3. Evaluate fruit and leaf nutritional balance and fruit quality under different light conditions. In many countries (Australia, Italy, Israel, South Africa, etc. 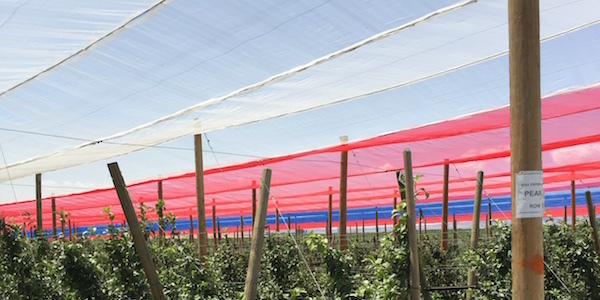 ), photoselective anti-hail nets (black, red, blue, green, yellow, and pearl) are commonly used to protect high-value fruit crops from hail, but have the added benefit of limiting sunburn in high temperature/light environments. 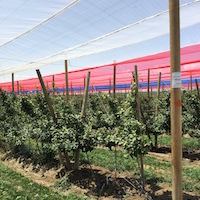 Washington apple growers who use overhead cooling to limit sunburn face several challenges: increased infrastructure and operational cost, disease spread (i.e. sphaeropsis rot), waterlogging problems in soil and possible reduced efficacy of foliar treatments. As the U.S. Food and Drug Administration begins to implement the future rules of the Food Safety Modernization Act, such agricultural water sources could require regular testing, may require treatment, and potentially could be eliminated from use for overhead cooling altogether. 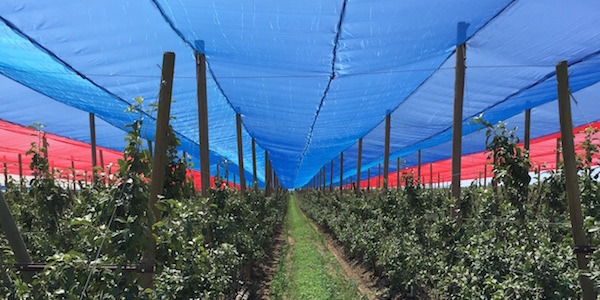 Photoselective anti-hail nets represent an alternative to overhead cooling to prevent sunburn and improve packout in apple orchards. 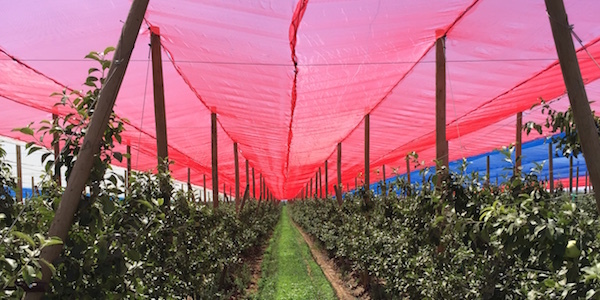 Netting is being increasingly utilized in Washington State, but relatively little is known about its impact on overall tree physiology, particularly using photoselective colored nets. This project addresses two WTFRC apple horticulture research priorities that are of the highest importance (food safety - overhead cooling issues and pre and postharvest fruit quality) and one of high importance (environmental stress and water relations). The high light conditions of Washington State will limit the impact of shading on photosynthetic performance. Summer light conditions in Washington State (1800-2000 umol m-2 s-1) normally exceed light saturation limits for leaves of apple trees (1000-1400 umol m-2 s-1). Therefore, reducing light intensity by 20% should have a limited impact on maximum light absorption for photosynthesis. Furthermore, the altered heat/light load in the net covered orchard reduces tree stress and should benefit both fruit yield and quality. Each net color has a distinct light spectrum signature that may affect responses to environmental cues that regulate vegetative growth, flower and fruit development. Some net colors result in improved fruit skin coloration and shoot vigor reduction. Infrastructure for a 12-acre netting trial that will start in 2015 was installed at a commercial Honeycrisp orchard near Quincy that was planted in 2013. Three different net colors (pearl, blue and red) will be tested and compared with an uncovered, over-head cooled control. A second, smaller scale netting experiment with the same treatments is being established in pot culture in hoop houses at WSU TFREC using 2 year-old trees of Honeycrisp that will first bear fruit in 2016. 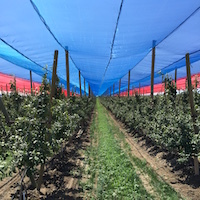 Quantitative assessment of the impact of photoselective anti-hail nets on orchard microclimate and physiology will enable the determination of both the benefits and management considerations of their use in Washington State.